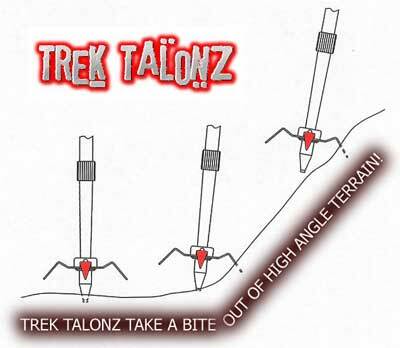 Maximize your trekking pole performance with TREK TALONZ ! 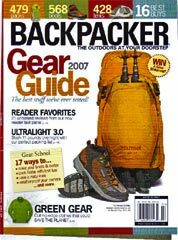 Attaches easily to most trekking poles, replacing standard baskets. Special teeth engage terrain while ascending, descending and traversing, providing greater security and more powerful, efficient arm strokes. Rotating design and tooth form minimizes snagging in brush. Sheds snow and mud readily. Made in the USA from special heat treated alloy steel. Lightweight- just 1.0 ounce each. Powder coated finish- available in a choice of colors. US and foreign patents pending. One pair Trek Talonz, model No. TT01 $24.95 US and Canadian addresses only. Where did you hear about Trek Talonz? * Items can also be purchased with Credit Card by calling (714) 990-3787 Foreign orders, please email us for prepayment.